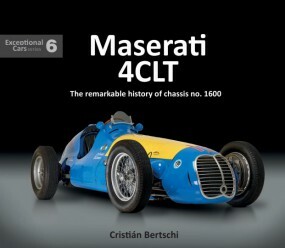 This book tells the story of one of the two cars bought by The Automovil Club Argentino (ACA). Painted in the bright blue and yellow Argentine racing colours, 1600 was to play an important role in the Argentine team's international expeditions to Europe. Fangio won two races in the car, the most important being at Pau in 1950, where he repeated his win in the ACA sister car a year earlier. As well as a detailed chronicle of the car's highs and lows, the text includes profiles of the drivers who raced in 1600 and a personal account of driving and running the car by a former owner who describes the daunting task of re-creating a Maserati 4CLT engine from scratch.